Cold Spring Harbor, NY — Bread wheat (Triticum aestivum) is one of the “big three” globally important crops, accounting for 20% of the calories consumed by people. Fully 35% of the world’s 7 billion people depend on this staple crop for survival. Now an international team of scientists, including a group from Cold Spring Harbor Laboratory (CSHL), has completed the first comprehensive analysis of its full genome. The study reveals the evolution of bread wheat from ancestral strains through to its current domesticated form. Due to the complexity of the plant’s genome the analysis proved a technically challenging. But the potential payoff is large: developing new strategies for breeding and improving wheat crops. To put the huge size of the bread wheat genome into context, its constituent number of paired DNA bases, or nucleotides, totals 17,000,000,000 base-pairs (17 Gb). This is about five times the amount of DNA in the human genome. However, as much as 80% of the bread wheat genome consists of repetitive sequences. Because of the way genomes are usually sequenced—by stitching together hundreds of millions or billions of tiny fractions of a full genome—the bread wheat genome’s size makes it very hard to determine which part of the genome any particular sequence readout has come from, and whether it is a unique or repeat sequence. The bread wheat genome is classified as a hexaploid genome. This means that it has six copies of each of its seven chromosomes; the complete set numbering 42 chromosomes. In contrast, the human genome is diploid, with 23 pairs of chromosomes and a total of 46 chromosomes. The CSHL lab of Professor W. Richard McCombie, Ph.D., was part of an highly collaborative international effort, involving several institutions in the United States and Great Britain as well as one in Germany, tasked with overcoming the technical challenge that sequencing this large, complex genome presented. To meet the challenge they used “next-generation” sequencing techniques, in which the DNA is broken up randomly into numerous small segments and assembled into longer sequence reads by identifying the overlapping ends. The sequence “reads” generated for bread wheat were then compared to those from the known sequences of a diverse range of grasses, including rice and barley. Sequencing the diploid ancestors of wheat, some of which was done in the McCombie lab, enabled the team to computationally dissect out which sequences were gene copies and which were repeats. This data was then used to further the understanding of the hexaploid ancestral genome and the temporal relationship between it and the diploid ancestor. Originally formed during the spread of agriculture among settled societies, bread wheat came about from the hybridization between cultivated wheat (T. dicoccoides) and goat grass (Aegilops tauschii) about 8,000 years ago. 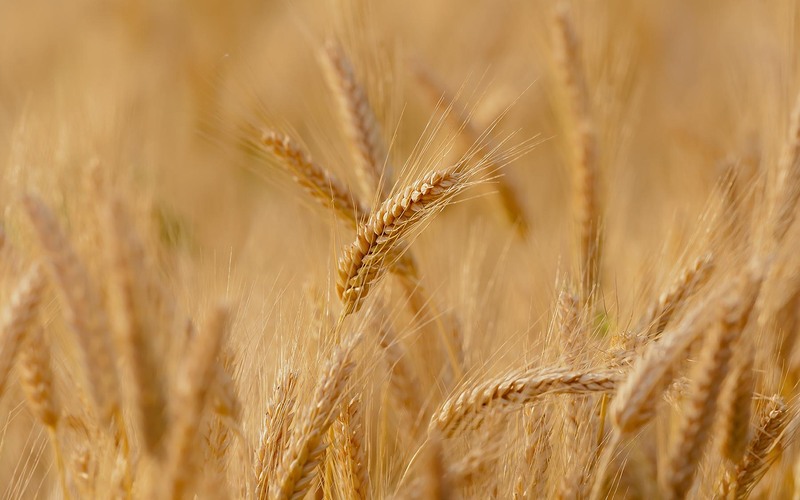 One aim of the sequencing project was to learn from the genome’s current features how bread wheat has evolved since its domestication. In this effort the investigators identified 94,000 to 96,000 genes. They also noted an abundance of gene fragments—ancestral genes that had been chopped up during the cross-breeding process used by farmers over the centuries. In addition they were able to assemble a catalog of 132,000 SNPs (single-nucleotide polymorphisms, or “snips”)—positions along the full genome where a single unit, or “letter,” of DNA varied from the sequence of closely related plants. This, and related research, reveals that the bread wheat genome has undergone rapid and significant changes, including loss of gene family members during the time it was being domesticated. This is when bread wheat moved from having two sets of chromosomes to multiples of that number—ultimately, the 6 sets seen today. This chromosomal multiplication is deemed desirable, as selecting for them is a way to overcome the sterility that occurs when breeding hybrid crops. 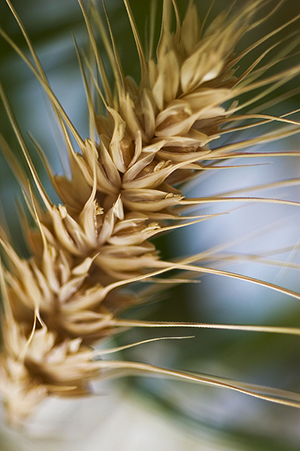 The investigators also found many expanded gene families within the bread wheat genome. The majority of these are associated with crop productivity and include ones involved in defense, nutritional content, energy harvesting, metabolism, and growth. Current breeding practices and knowledge have been exploited to the point that yield increases have slowed. The sequencing and analysis in this study provides a framework with which this crop can now be improved. “While we and our collaborators continue to work to enhance the resolution of our knowledge of the wheat genome, these results should have an significant impact on breeding efforts and further research studies of the wheat genomes and its those of its wild relatives,” said McCombie, summing up the project’s technical and biological impact. The research described in this release was supported by the following grants and funding agencies. The UK Biological and Biotechnological Sciences Research Council (BBSRC) grants BB/G012865, BB/G013985/1 and BB/G013004/1 to KJE, MWB and NH, a Wolfson Merit Award from the Royal Society to NH, BBSRC Strategic Programme Grant B/J004588/1 (GRO) to MWB, EC TriticeaeGenome grant #212019 to KFXM and MWB, The TRITEX Project of the Plant20130 Initiative of the German Ministry of Education and Research grant #0315954C to KFXM, EC Transplant Grant 283496 to KFXM and PK, A BBSRC Career Development Fellowship BB/H022333/1 to AH, NSF grants IOS-1032105 and DBI-0923128 to WRM, USDA-NIFA grant 2008-35300-04588 to BSG, and NSF Grants DBI-0701916 to JD and DBI-0822100 to SFK. “Analysis of the bread wheat genome using whole genome shotgun sequencing” is published online in Nature on November 29, 2012. The authors are: Rachel Brenchley, Manuel Spannag, Matthias Pfeifer, Gary L.A. Barker, Rosalinda D’Amore, Alexandra M. Allen, Neil McKenzie, Melissa Kramer, Arnaud Kerhornou, Dan Bolser, Suzanne Kay, Darren Waite, Martin Trick, Ian Bancroft, Yong Gu, Naxin Huo, Ming-Cheng Luo, Sunish Sehgal, Sharyar Kianian, Bikram Gill, Olin Anderson, Paul Kersey, Jan Dvorak, W. Richard McCombie, Anthony Hall, Klaus F.X. Mayer, Keith J. Edwards, Michael W. Bevan and Neil Hall. The paper can be obtained online at doi: 10.1038/nature11650.